Through the dark side you find your brightness. 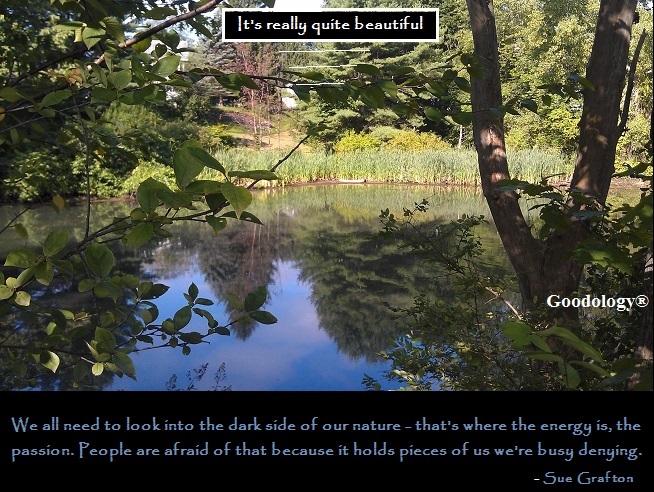 This is a good quote which I combined with a picture that I took of a very small pond across the street from my house in Massachusetts. “We all need to look into the dark side of our nature – that’s where the energy is, the passion. People are afraid of it because it holds pieces of us that we are busy denying.” -Sue Grafton. The pond could be considered ‘swampy’ and not so attractive. So, we have a metaphor with the beauty of this pic and quote. We sometimes read discomfort inside as unattractive. It’s not. It is just energy. Embrace your energy, all of it, the discomfort and resistance. The energy is really quite beautiful…. if you allow it. Through the dark side you find brightness and light. Sometimes it is uncomfortable which makes it hard to navigate and take a step further. Try. It’s easy to look at that pond and think it’s gross. But, look. It’s really is beautiful. Like you. You can totally become good at this by reading and re-reading my book. It’s here.